Toronto, Canada, and Virginia Beach, VA, July 15, 2008 - Sixty-five percent of Americans are overweight or obese, increasing their risk for serious health conditions such as diabetes, heart disease, and cancer. Worldwide, 1.6 billion people-one out of four-pack on too many pounds. A solution is urgently needed. is a revolutionary new book that gives you the tools you need to lose excess weight and achieve total wellness. 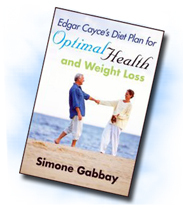 Visit http://www.edgarcaycediet.com.